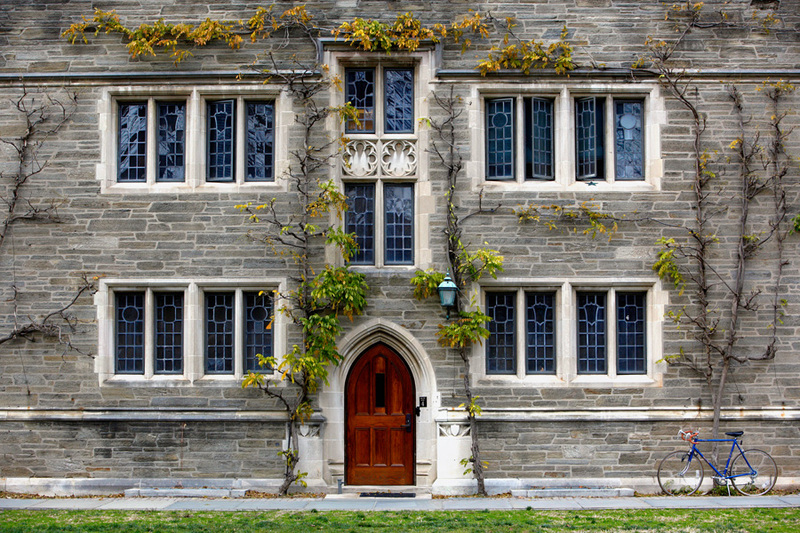 This sublime residence hall on Princeton University's main campus was a gift of Mrs. Mary E. L. Joline in memory of her husband, Adrian Hoffman Joline. Joline, class of 1870, graduated from this august institution when it was still named the College of New Jersey. It wouldn't become known as Princeton University until 1896. Adrian H. Joline was an attorney early in life and later became a prominent railroad executive. He was also a celebrated author: Meditations of an Autograph Collector (1902), Diversions of a Book Lover (1903), and The Autograph Hunter (1906). Adrian Joline Hall is a dormitory of Mathey College, one of six residential colleges on campus. It was built on a long, narrow site during the Depression which may account for its relative dearth of lavish Gothic ornamentation found elsewhere on campus. At this time of year - and in stark contrast to the city of Princeton - one is struck by a complete lack of holiday decoration throughout the campus. But reflecting on the fact that Princeton is an ecumenical university, with a student body and faculty made up of many and varied cultures and faiths, this suddenly makes sense. The beautiful elevation of Adrian Joline Hall doesn't need decorating anyway. The lovely, autumn clad Wisteria sinensis adorning the wall is enough. Text copyright © 2010 Edward F Petersen. Photographs © 2010 Kathleen Connally.